Operating as a mason and builder, he was involved in the design and building of some of Glasgow�s most important 17th Century buildings. 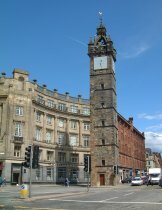 Between 11 February and 18 March 1626, he worked with Patrik Colquhoun in demolishing the old Tolbooth at Glasgow Cross, and was appointed as Master of Work on the construction of its replacement, of which only the 126ft steeple stands today; the main part of the building having been completely altered in 1814 by David Hamilton , and then finally demolished in 1921. The steeple features some of the oldest sculpture in the city, including a small shield carved with an early version of the Glasgow coat of arms, and thistle motifs similar to the many others that were also on the building's demolished facade. Also surviving the 1814 rebuilding, and subsequently relocated, was the building's most important sculpture: the Royal Arms of King Charles I. These were carved on a panel above the main door and were rescued and placed on the back of a tenement at 7 High Street. The arms were rescued again in the early 1900s when the tenement was demolished, and are now on display in St Nicholas' Garden at Provand's Lordship, Castle Street. Boyd also restored the Library in the south-west tower of Glasgow Cathedral (1628, dem. 1846-9), and was employed on work at the Old College (1630s, dem. c. 1870); and Hutchesons� Hospital, Trongate (c. 1643, dem. c. 1795), for which he was paid �26. 16s. In the summer of 1630, Boyd carved the town's arms for the Meal Market and Correction House (both demolished).